Julia Scott had no interest in climbing into an “iron lung.” She told me the device looks like something only Dracula would lay in. 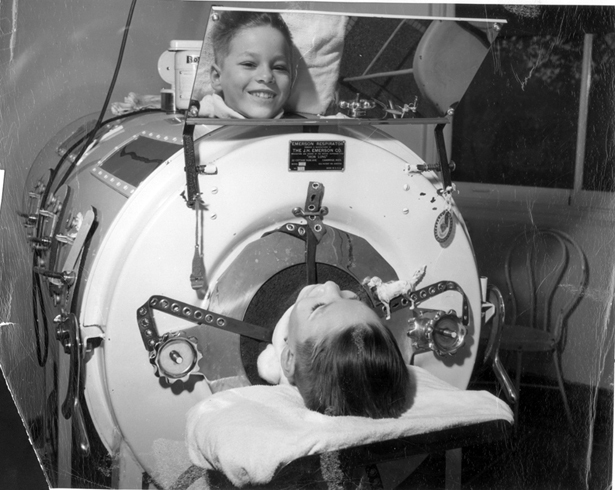 Of course, Martha Lillard, who uses the iron lung pictured above, is no Dracula. She’s a victim of the polio epidemic of the 1950s and needs the lung to stay alive. Julia produced a story on Martha and her iron lung — one of only about a dozen still in use in the United States — for PRX’s Stem Story Project, a series of features focused on science, technology, engineering, and math. After interviewing and collecting the sound of the machine, Martha asked Julia if she’d like to get in and try it out. Despite her trepidation, Julia timidly said “yes” and she’s glad she did. Laying inside the lung gave Julia a new perspective. She says she viscerally became aware of what it meant to have a machine take over breathing, an understanding she couldn’t have gained from an interview alone. To be sure, Julia didn’t use the lung for nearly sixty years like Martha has, but that sort of “participant observation”, even if brief, was incredibly valuable when writing the story, she says. Have a listen to Julia’s feature “The Last of the Iron Lungs” on this edition of HowSound.